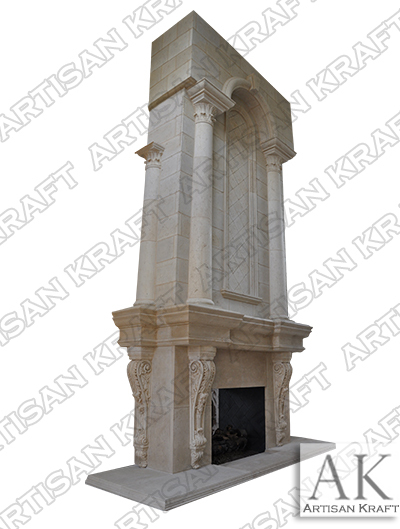 Grand Tradition Custom Overmantel is pictured on our home page with a zoomed in on the oversized corbels. The name says it all. Grand in every way. This is a huge 22 foot tall overmantel surround. It can be made smaller in height and width. The hearth is 2.5″ thick with several steps. The step hearth is matched by the step mantel shelf. Everything wraps around to the sides of the build out. Hearth and mantel shelf are project out and wrap. Corbels on the sides matched the two front facing. Tapered plain columns sit on the projected shelf on the sides of the framed arch. Capped by Temple of the Winds capitals. Smaller Temple of the Winds stacked columns are on the sides. These side columns are also tapered. This all sits on the cast stone wall cladding. These rectangular wall panels are staggered. Square tiles are placed inside the frame in a diamond layout.